Distempering is the widely used method of painting the interior as well as exterior surfaces of the house. It is just a process of applying wash like white wash or colour wash on the surface. But the finished surface obtained by distempering is far superior to those obtained by white or colour wash. Distempering is done by distempers. Distemper consists of Chalk powder mixed in water with colouring pigments. Dry distempers are available in powder form. They are mixed with hot water before use. Oil bound distempers are available in paste form in different shades of colour. Before applying, it is mixed with water to dilute it to the required consistency. After application on the surface the oil content of the distemper hardens and forms a durable coating. Thus Oil bound distempers are superior to Dry distempers. Oil bound distempers are washable also. Generally manufacturers of distempers provide instructions regarding how to use their product. These instruction should be followed strictly in order achieve best results. However, in absence of the above mentioned instructions the process of distempering can be carried out in the following stages. Preparation of surface: The surface for distempering should be prepared as follows. If there is any spot of efflorescence, that should be wiped off completely with the help of dry cloth. First of all the surface should be made dry completely. Dampness in the surface spoils the distemper coat. 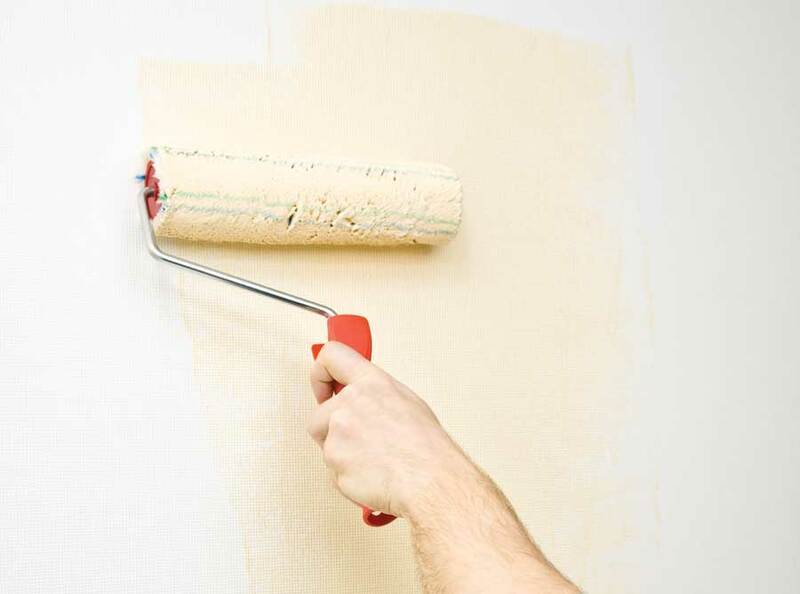 New plastered surface should be left for at least 2-3 months so that it may dry out completely. Holes, cracks etc should be filled up with lime putty or gypsum and left for hardening. On old surfaces, the old distemper coating should be removed by washing the surface with water. After that the surface should be left for drying. The surface to be distempered should be rubbed thoroughly with sand paper and cleaned. Applying prime coat: After preparation if the surface, a priming coat is applied to ensure good bound between distemper coat and the surface. The priming coat may be composed if Chalk powder mixed with water. But usually, manufacturers recommend the use of material for priming coat for their product. After application of priming coat it should be allowed to get dry before distemper coat is applied over it. Sometimes cement wash is given on the surface to act as prime coat. Application of Distemper: After the priming coat, first coat of distemper is applied on the surface. The first coat should be of a light tint and applied with great care. Second coat is applied after the first coat has dried completely and become hard. Sometimes, if application of prime coat is not felt necessary, a coating of warm glue should be applied prior to application of distemper. Distemper coats are applied with the help of broad stiff distemper brushes. Nowadays distempers can be applied with the help of spray pistols also.